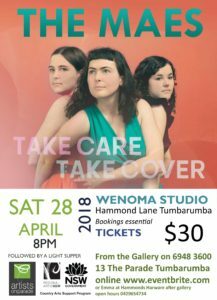 Tumbarumba welcomes the Mae Trio for their first concert at Wenoma Studio. This will be their last Australian concert before heading off to Canada. 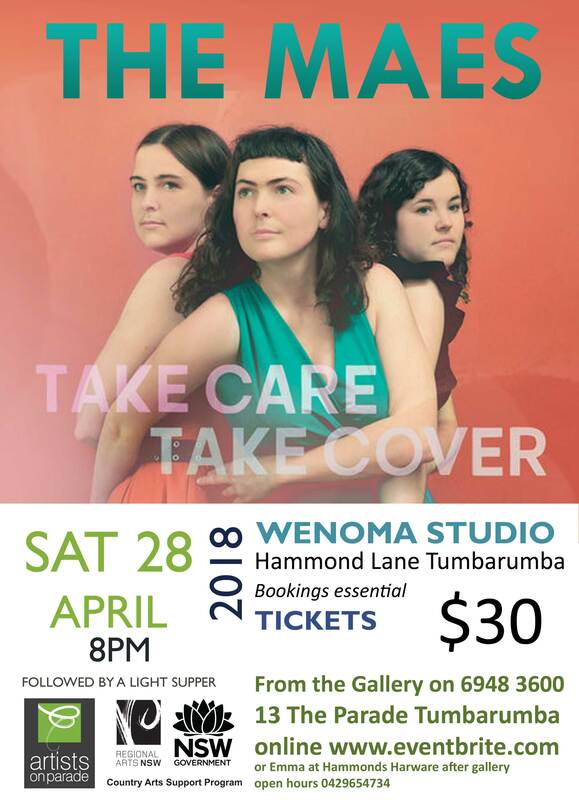 Melbourne’s The Mae Trio return with their unique contemporary twist on folk music with their sophomore album, Take Care Take Cover, set for release April 2017. Their debut album, Housewarming earned them Folk Alliance Australia Youth Award and NFSA Folk Recording of the Year and saw them tour Australia, Canada, USA and Europe with performances at the Hydro Stadium at Celtic Connection, Glasgow, Americana Folk Festival, Nashville, Cambridge Folk Festival, UK Edmonton Folk Festival, Canada, and Port Fairy and National Folk Festivals, Australia. The trio comprising of Maggie Rigby (banjo, ukulele, guitar and vocals), sister Elsie Rigby (violin, ukulele and vocals and Anita Hillman (cello, bass and vocals), grew up steeped in music. Elsie and Maggie played in their family band and spent their childhood going to music festivals and camps, choir rehearsals and concerts while Anita with her classical pianist mother and folk enthusiast father, grew up playing in orchestras, string quartets and jazz ensembles. When Maggie and Elsie asked Anita to play the cello on an album they were recording with their family band in 2011, little did any of them know they were embarking on an adventure which would change their lives, and see them throw in the towel of their regular jobs/degrees/lives. Supper is included in tickets.